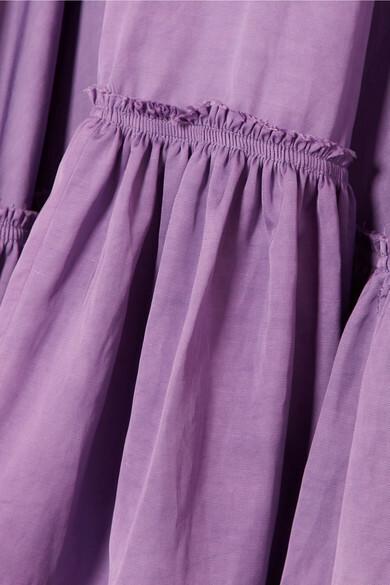 Solace London's Spring '19 palette stems from the tones of the purple allium flower - it includes every shade from deep violet to the sugary lilac of this 'Haye' dress. It's woven for a crisp handle and has a voluminous ruffled tiered skirt that swishes dramatically when you move. Wear it with your hair swept-back to reveal the wide square neckline. Shown here with: CALVIN KLEIN 205W39NYC Shoulder bag, REJINA PYO Mules, Leigh Miller Earrings.